Run a line through the United States that perfectly bisects the country's north-south population and you'll find it running smack dab through the middle of Missouri, an imaginary line just south of I-70. Plot a route along the nation's mean center of population — "the place where an imaginary, flat, weightless and rigid map of the United States would balance perfectly if all residents were of identical weight" — and the U.S. Census Bureau's tabulations tell us that since 1980 you'll find that spot in Missouri too, rolling gently westward along the same path as the old Route 66 to its most recent home, in 2010, in the village of Plato (population: 109) in Texas County, where a geodetic marker commemorates the occasion. If that's not enough to convince you of the state's ideal positioning for logistics and distribution, take it from the corporate leaders who are investing millions of dollars there to achieve competitive advantage. Over the 30 months ending in December 2017, Site Selection magazine's Conway Projects Database has performed its own tabulations of private-sector facility investment and tracked more than 50 logistics and distribution center projects — including one from FedEx in Phelps County, home to the demographic mean center of the U.S. population in 2000 and to Missouri University of Science and Technology (S&T) in Rolla. 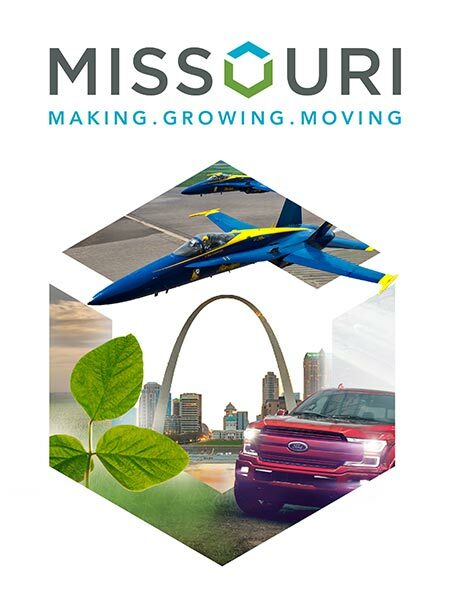 The $10-million, 30-job project was one of several in Missouri from the Memphis-based package delivery and logistics giant over the past couple of years. Among other projects were a $100-million, 400-job expansion from St. Louis's beloved Schnuck's grocery; a $111-million, 360-job new facility from CVS Pharmacy in Kansas City; and a $103-million, 375-job project from Dollar Tree in Johnson County city of Warrensburg, about an hour east of KC along I-70 and home to the University of Central Missouri. In April 2017, Quiet Logistics, Inc., a provider of outsourced fulfillment solutions, announced the opening of what it calls the "Fulfillment Center of the Future" in Hazelwood, just outside St. Louis. The Massachusetts-based company said the new location was "strategically located to enable two- and three-day shipping to e-commerce customers across the United States." At capacity it will be staffed by approximately 250 full-time employees working alongside a Locus Robotics autonomous picking solution for maximum efficiency and accuracy. "Thanks to this new location as well as strategic carrier partnerships, Quiet is now able to reach 100 percent of the U.S. population in two to three days at extremely competitive rates," said the company, "often with far less accessorial charges than other US-origin ZIP code[s]." The Midwest hub offers e-commerce retailers two-day delivery transit time to New York City, and three-day transit to Los Angeles via ground shipping. "Managing split inventory cross-country is no longer a necessity when a fulfillment network can provide two-day delivery to the majority of [e-commerce] shoppers," said Dr. Brian Lemerise, president of Quiet Logistics. For Dollar Tree, a new 1.2 million-sq.-ft. distribution operation in Warrensburg's Brady Commerce Park will help the discount retailer serve the Midwest region of the company's vast network of more than 14,300 stores in the U.S. and Canada. The company's 23rd North American distribution center will see 150-200 inbound trucks per day. In 2016, Dollar Tree jumped 150 spots on the Fortune 500, from 330 to 180. "Dollar Tree is a large and growing organization," said Dollar Tree CEO Bob Sasser in April 2017. "We have been very impressed with the business-friendly approach that the State of Missouri, Johnson County and the City of Warrensburg have provided." "This was a project that required coordination at all levels, and the joint efforts of the governor, the Missouri Department of Economic Development, the Missouri Development Finance Board, our team, Johnson County, KCP&L, Spire, and the City of Warrensburg were excellent," said Missouri Partnership CEO Steve Johnson. "It is great to see yet another company take advantage of Missouri's unique distribution and logistics strengths." Missouri's historical logistics strength goes way back to wagon trails and the Mississippi River. Today those trends converge with rail, No. 1 among 31 logistics industry subsectors when it comes to employment concentration in the state. The St. Louis Regional Freightway was launched a few years ago by Bi-State Development to enhance and grow what its leaders say is $6 billion in goods traveling through the St. Louis area by rail, road, river and runway, while also laying the groundwork to ensure the region's infrastructure can handle the growth. The push comes at a time when one stretch of the river has seen investment upward of $200 million in barge transfer facilities to rapidly move long unit trains full of agricultural commodities onto barges and on to global markets. At the organization's annual conference in May 2017, Mike McCarthy, chairman of the Freight Development Committee and president of Terminal Railroad Association (TRRA) of St. Louis, cited the Freightway's ability to develop and build consensus around a list of 20 priority projects necessary to modernize the region's freight infrastructure as a key accomplishment, starting with replacement of the 127-year-old Merchants Bridge, one of two rail bridges used by six Class I railroads and Amtrak to cross the Mississippi River at St. Louis. Regional highway improvements are also high on the list. The state's seventh Class 1 railroad, KC Southern, comes to Missouri through Kansas City providing every Class 1 railroad in the country and direct rail access to the deep-water ports in the Gulf of Mexico. "I like to refer to the U.S. supply chain as a weapon of mass competitiveness," Rose said, citing the Merchants Bridge project opportunity. "Growth in a region's economy is rarely by accident, or simply because of the natural assets or advantages a region has. It takes work. Here in St. Louis you understand that, and you're working together." A U.S. Department of Transportation INFRA (Infrastructure for Rebuilding America) grant application for the bridge replacement project was submitted in early November 2017. With all of the engineering for the replacement project completed, and permitting nearing completion, the focus is now on financing the $214-million project, says the Freightway organization. With two-thirds of the project cost being privately funded by TRRA, the organization considers the project a model for public-private partnerships.